All my dogs are crate trained, but having a young puppy in the home for the first time in many years reminded me how important it is to start the crate training process early! I hear horror stories of other people with puppies who destroy their homes, but my puppy, who is always either supervised or confined, has never had the opportunity to rehearse inappropriate or destructive behaviors, in big part because of crate training! I recommend introducing your dog or puppy to her crate the first day you take her home. Crate training a dog is an excellent way to help your new pup be successful in the home and, when done positively, builds on a dog’s natural instincts to sleep/rest in quiet, den-like places. Crates ensure your dog is safe from potential hazards in your home when you can’t supervise her. Crate training — when done right — shouldn’t be stressful for your dog and will give her some personal space and a great excuse to take a break. Proper crate training starts with choosing the right dog crate. Photography ©WilleeCole | Thinkstock. The first step to successful crate training is finding the right crate. From airline-approved carriers to hard sided, wire crates to soft-sided crates, there are many options. For crate training a dog, start with either hard-sided plastic crates or wire crates since they are easy to clean and sturdy. Aesthetically, I prefer wire crates to hard-sided plastic ones since I have big dogs and those crates are focal points in my home. You can also purchase custom-made wood or metal crates if you are looking for something that you can personalize to your decor, but wait to make that investment until your dog is fully grown — and fully comfortable with crates. Selecting the right size crate is also key. If your dog is going to be large, you may need to invest in multiple crates as your puppy grows, or use a crate divider to make a large crate smaller when your puppy is young. The ideal size crate will be large enough for your dog to comfortably stand, sit, stretch, turn around and lay down. Any bigger than that, and the crate may be too large for a puppy who is still working on getting the hang of potty training. A benefit of a plastic crate is that it’s already dark and cozy, which helps dogs relax and understand that crate time is a good time for a nap. If you select a wire crate, cover at least the back portion of the crate with a blanket or towel to make it darker and cozier. Be sure your dog can’t pull the blanket through the wires, though. Start slowly when crate training a dog. Be intentional about introducing your puppy to her crate, and turn crate training into a fun game. Part of helping dogs adjust to crate training is to turn their crates into very high-value spaces. One strategy for doing this is to feed your dog her meals inside the crate. This will help the dog start to associate her crate with awesome things — like dinner! Continue to make your dog’s crate the most delicious and delightful place for her to be with a variety of safe chews and toys. Slow-release items, like food-stuffed treats, are excellent. (Frozen peanut butter and pumpkin and are my go-to for Kong treats — but some people get really fancy! Check out this Pinterest page of ideas.) For young puppies who were just separated from their mom or siblings, take a blanket or stuffed toy that had been with their mom and littermates and put that in their crate to help them adjust to being alone. Don’t ask your dog to do more than she is able to handle based on her level of training and maturity. When crate training a puppy, a good rule of thumb is crating your puppy for one hour for every month, plus one. So, a four-month-old puppy could, at max, handle being crated for five hours. But when you start crate training, begin with much smaller increments of time, building up from a just a minute or two with the crate door closed while distracting your dog with a yummy treat. If your dog isn’t stressed, continue adding time in her crate. Don’t put your crate in a super busy area of your home that may cause overstimulation. Play soothing music when your dog is crated to help her relax and tune out. If your dog is sleeping in the crate at night, place the crate next to your bed so that if she wakes up at night you can reach down and reassure her of your presence. A crated dog should also have privacy. Don’t let children or other dogs approach a dog in a crate, and never permit anyone to poke their fingers through your dog’s crate. Not only is it rude, it can make the crated dog very nervous because she is, in effect, trapped. This may lead to reactivity or bites from a fearful dog. Just as important as how you work with your puppy in her crate is what you do with your puppy outside of her crate. Both age-appropriate physical and mental activities will help your dog be ready to rest when you put her into her crate. A tired dog will have a much easier time settling in her crate. When you are introducing your dog to her crate, you want it to be a fun experience. Never use the crate for punishment, and try to avoid making a big deal about greeting your puppy when you return, or about goodbyes when you crate her. It’s hard. Dogs — especially puppies — are adorable and we miss them, but creating a big emotional experience out of leaving/returning will make it much more difficult for your dog to adjust to the crate. Car Crash: A dog who is riding in a crate in the car is much safer than a dog left loose in the vehicle (although the safest option is to put your dog in a crash test-approved harness). The Center for Pet Safety even conducted a crash test using dog crates in 2015 and ranked different crates. Check out how your brand performed, and some intense crash test video here. Evacuation: While some shelters for natural disasters are now pet friendly, many require families to crate their dogs. Don’t let your dog’s first experience with a crate be in a stressful and strange environment. Injury: When my Newfoundland puppy tweaked her knee over the summer, I panicked. Thankfully, after consultation with a veterinary surgeon, it was just a sprain. All our dedication to crate training paid off during her recovery. “Crate rest” is a really common course of treatment for dogs recovering from surgery or injured limbs. If your dog already associates her crate with positive things, it won’t feel like punishment to have to spend extra time in a crate recuperating. Struggling with crate training or looking for more suggestions on how to make crate training fun and engaging? Try Susan Garrett’s Crate Games DVD program. While crates can keep your dog from damaging your home, they are not cures for separation anxiety. If you think your dog has separation anxiety, or it seems like she is at risk of injuring herself trying to get out of her crate, consult with a professional dog trainer or your veterinarian right away. Thumbnail: Photography ©Barnes_Photo | Thinkstock. 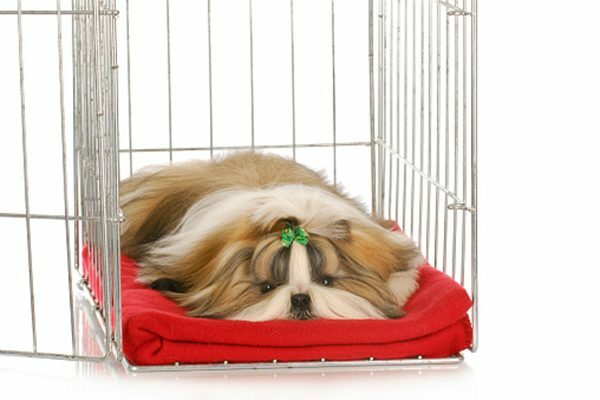 The post Simple Tips for Crate Training a Dog appeared first on Dogster.